Why BYOD Will Only Fail in a Corporate World. There has been talk of BYOD aka Bring Your Own Device as being the next big thing. There has been talk of BYOD aka Bring Your Own Device as being the next big thing. We're told that business should support this and the way we deliver the software should work on all of these devices. At a quick glance BYOD sounds an interesting concept. Should we embrace it? Absolutely. Right Now, NO. BYOD is currently in poor form and does not have the right infrastructure to support it. Not only this, it raises issues of security and responsibility. This comes off the back of the Crypto Virus running rampant on one of our Networks. Where did it come from? Dropbox on an employees connected home PC. Files were encrypted by the virus on the employees home PC and then synced into the Office. Who takes responsibility for the virus and ensures that it is cleaned efficiently and in the quickest time possible? Who takes responsibility for any security breaches that may occur on the users own device? Who takes responsibility for maintenance of the device. In our case we were not able to put a stop to the virus easily because it was on a users home computer, we can disccnnect them, but they simply can reconnected again, and often fail to have their computer cleaned properly. Should we simply deny access to our network until the device is fixed, or does I.T get stuck supporting and ill maintained device. I have seen my fair share of home users computers and the state they are in, are generally unfit for business use. Running Windows Vista, an outdated 30 day trial of Norton 360, a triad of games the kids downloaded the night before and enough spyware pop ups flashing to make you think your at a night club. It's well known that home users do not often know that much about computers and how to maintain them properly, so why on earth would anywone EVEN consider letting the employee manage their own hardware. They lack the ability, so we should not allow BYOD on our networks in it's current form. It's a joke and it's largely mislead. Im sorry but if you don't know what a firewall does or what Port 80 is used for then you probably should not be allowed to BYOD. Right now the best thing going are organisations allowing employees to choose their own hardware platform funded and maintained by the organisation. Not every organisation has budget to roll out and support different platforms, but more organisations are recognising employees work best on their desired platform. They usually know that platform well, and the employee will give the organisation better results in return. 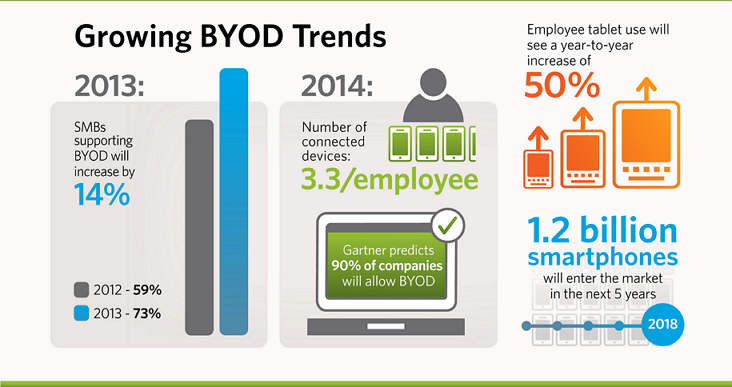 The right framework to support BYOD is simply not there yet. Im sorry but Citrix does not cut it. There are security holes and higher risk associated with BYOD. Was the device patched and when was the last update run? If a BYOD should fail during the day, does it become the responsibility of I.T to find a spare device for the employee to continue working? You may even find yourself employing more I.T staff just to support BYOD as you are effectively expanding your network. Each employee typically has about 3x connected devices that they may want to work from, and these are 3 more that I.T will be lumped with.